Hello I can finaly share with you what I ve designed for the Scrapagogo using the december kit. 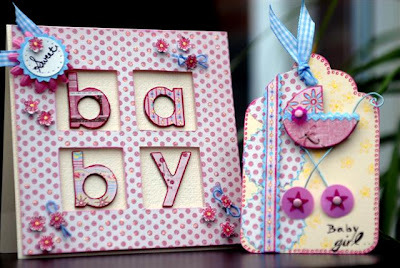 It was just delightful, yummy papers from Daisy Bucket, chipboard letters ribbon brads, sequins, a lovely stamp lots of things. 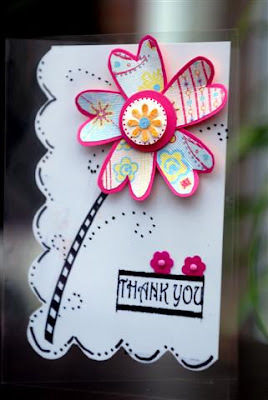 The free stamp was the Thank You stamp and I ve used it to make the card below. I ve stamped the image three times using diferent colour inks and mounted on a long panel then made it look like it was hanging using some baby blue twine, a strip of one of the gorgeous papers and Voila!! 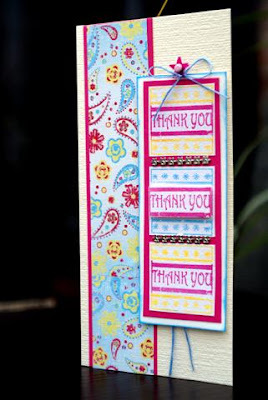 a cute thank you card, oh forgot to say please note the fab metal trim that I ve used in between it was lush!! Next was a baby duo, polka dots are my favorite things ever so I had to use this papers for some baby stuff. 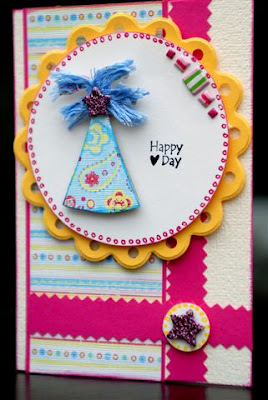 The fab thing about this kits is that you get nice shaped cards, and this aperture one here is an example of it. Covered some chipboard letters with a variety of papers , then I ve cut the tiny little flowers out and 3d mounted in little groups and doted about. the sweet sentiment was stamped out using the free stamp from octobers kit. 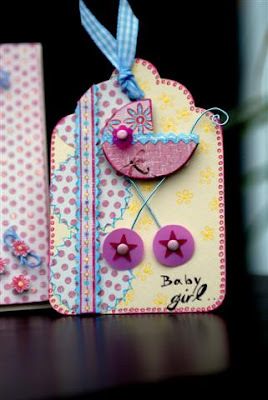 Here I ve used one of the chipboard shapes( I think it was a baloon) to make the pram, used sequins and brads that came in the kit for the wheels and some gingham ribbon. Oh there was a acetate card included in the kit as well so I just had to have a go at one and here it is, lots of doodles on this one and that fab stamp again. And finally my favorite out of them all. I ve designed this for my friend s little girl( it was her brithday ) and I just love the way it turned out also nice that I ve come up with the design myself didn t see it anywhere ..is mine all mine lol. January s kit is just as fabulos(in fact I really really liked jan.) and you won t belive it, feb.s just been delivered by the postie( very excited about this one something very very special inside it). Look after yourselves see ya!!!!! Monica you are ONE super talented bunny!!! OMG, I cannot even pick a piece I love more that the rest cos they are just all so flipping fab! And yes, you are SO right about us match-making my niece Grace with your gorgeous Luca, OMG think how fab their wedding invites would be lol! Delicious cards, really gorgeous papers.